Manila, Philippines - Some local government units (LGUs) announce class suspensions for Monday, January 20, 2014 due to inclement weather situation as typhoon 'Agaton' maintained its strength over the areas of Mindanao.The advisories were released thru social media on Sunday, January 19, 2014. According to the weather bureau PAGASA on Sunday afternoon, Typhoon Agaton Public Storm Warning Signal #1 (winds of 30-60 kph is expected in at least 36 hours) is raised over Surigao del Sur, Agusan del Sur, Davao Oriental, Davao del Norte, Davao del Sur and Compostella Valley. 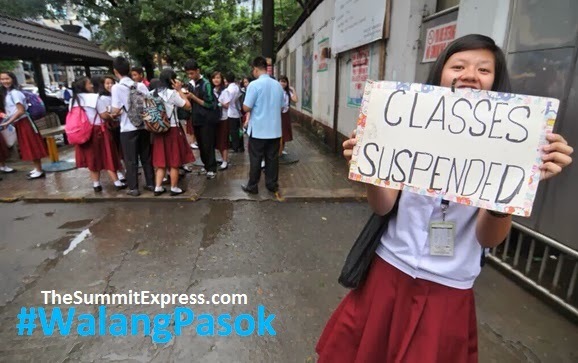 Students are advised to use #WalangPasok hashtag on Twitter to monitor class suspension updates. Like Us on Facebook or Follow Us on Twitter for more updates regarding #AgatonPH and class suspensions from LGUs.